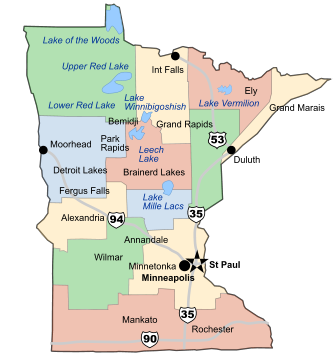 Where is all the Minnesota land in a "land of 10,000 lakes"? The 32nd state of the union coined this numerical phrase in a time before the official count could be made: 11,842 lakes over 10 acres in size. Lake Itasca boasts a role of being the headwaters to the mighty Mississippi. Even the Mississippi itself is fed by the St. Croix, Minnesota and Red rivers. Between these abundant sources of water, it's hard not to find great land in Minnesota. Outside of the urban center of Minneapolis and St. Paul, Minnesota is divided into three distinct geographical regions. The eastern portion of the state is a vast swath of prairie, used predominantly for agricultural purposes. In the North lies a thick, sparsely populated Boreal Forest (a.k.a. Taiga). The Boreal is a harsh climate for flora, but provides a great habitat for bears and other hardy mammals. The far southwest is a much more reliefed region due to the lack of glacial drift during the ice age. This lack of glaciations caused hard ruts to be carved in the bedrock of streams and rivers. It is important to consider this geography when choosing a plot of Minnesota land. Hunting is plentiful year round, but deer hunters should be aware of where they're purchasing land. The Minnesota Department of Natural Resources defines four zones within the state that determine seasons. Zone 1 in the aforementioned southeast has the longest firearm deer season (3 full weeks in 2007). However, the vast zone 4 - which covers Minnesota from Leroy in the Southeast, up to Hallock near the Canadian Border - only had 5 total days of rifle hunting. Be sure to check which zone your property is in when making a hunting land purchase. Deep in the Boreal Forest of the north, prospective investors will find the most unspoiled land. To the Northeast lies the state-owned boundary waters, a natural phenomenon that visitors travel to in order to completely escape civilization. Though much of the forest has been heavily logged in the past, the coniferous forests are making a very strong comeback through numerous conservation efforts. While not ideal for agriculture, the undisturbed lands of the north can make for a great hunting or fishing getaway. Minnesota also maintains a rich diversity of fauna throughout the state. Within the United States, Minnesota's population of timber wolves is second only to Alaska. In addition to white tail deer, Minnesota also continues to have a healthy population of moose and elk. In the past Minnesota even had herds of Bison, although not in the great numbers that prevailed in other prarie states. Agriculture boasts a long and varied status throughout Minnesota. Though topsoil is poor in the northern forests, the vast deciduous land provides ample opportunity for the hobby farm. In fact, from the 12 soil classifications put forth by the National Resource Conservation Service (NRCS), Minnesota has 7. With such variations, the potential Minnesota hobby farm will also see variations in the number of growing days - from almost 150 in the south, to less than 100 in the far north. Because of this, it's important for potential land owners to discuss such qualities with locals before making a purchase. Much like its neighbor, Wisconsin, Minnesota protects its shoreline from dangerous building practices. The Environmental Services Department (ESD) of a given county defines setback areas on a per-lake basis, so be sure to check the local ESD office when purchasing land situated on a waterfront. On Lake Barnum in Cass County, for example, the setback is regulated at 100 feet. This can be further complicated if your shoreline contains a bluff - a rise of 25 feet or more, with at least a 30% grade going into the Ordinary High Water Line (OHWL). Certain exceptions to the setback rules apply. In many places, the clearing of dead trees and vegetation is allowed up to 50' from your home. A twelve foot wide access-path, leading to the water is acceptable, barring bluff restrictions. Structures covering less than 100 square feet are also generally allowed, but per-county regulations still apply. The rules governing Minnesota land use varies from county to county. It is important to check with the county offices with regard to specific regulation for your zoned lands. It may be necessary to contact ESD, DNR, and the County Clerk to ensure compliance with state and local regulations. For those looking for a permanent relocation Minnesota provides an incredible tax break. Forms can be filed with the state IRS declaring your building and property your homestead. This will give you a tax credit of up to $1,705, if your annual income was under $93,000. Even if you don't qualify for the credit, the property will be taxed at a lower homestead rate. This gives a sizable incentive to cashing in the 401k early and turning the vacation property into a dream home. It's easy to get lost in Minnesota. Since the days of the Dakota Indians habitation of this land, it has offered a bounty of natural treasures to its settlers. People who own land in Minnesota, it seems, are never far from great fishing, great hunting or great people. There is, perhaps, no better spot on Earth for recreation than the beautiful state of Minnesota. Countless acres of unspoiled forests - serene, crystal lakes - and thriving metropolitan centers combine to create a vacationing utopia. Not only is Minnesota the perfect spot for family recreation, Minnesota also offers numerous types of real estate investment opportunities for everyone from the casual to the seasoned real estate investor. Recreational properties, hobby farms, timberland, farm land and hunting land provide countless opportunities for individual and corporate real estate investors alike here in the great state of Minnesota. With acres of wilderness and forests, Minnesota is a great spot for hunters looking to invest in the perfect piece of hunting land. Game such as black bears, wild turkeys, white-tailed deer, pheasants, ducks, geese and even the occasional moose or elk provide hunters with ample targets in the Minnesota Northwoods. Expansive and secluded Minnesota hunting land tracts are available throughout the state, featuring diverse terrain including rambling streams, raging river rapids, untouched pine forests, grasslands and beautiful lakes. Fishing is plentiful here in Minnesota and owning land with a lake or stream can be an ideal way to experience some of the finest fishing in the world without interference or interruption. Owning a own tract of hunting land will help ensure plentiful game and the ultimate in outdoor seclusion for the hunting aficionado. Invest in Minnesota hunting land and come experience some of the finest hunting the northern United States has to offer. For outdoor recreation, Minnesota cannot be beat. Peaceful, secluded and gorgeous, Minnesota offers an escape from the ordinary, overcrowded and touristy destinations that seem to be inexplicably popular nowadays. Families can relax in a spacious, homey vacation cabin by a crystal, clear lake. Summer brings fishing, hiking, swimming and water sports. Even though it may sound foreboding, Minnesota winters are a great time to visit this northern region. Ice fishing, cross-country skiing, sledding, snow-mobiling and hunting are all classic Minnesota cold weather pastimes. With its breath-taking scenery and slower, more relaxed pact of life, Minnesota allows individuals and families an opportunity to truly get away from it all and re-connect with themselves and each other. The region of the Chippewa National Forest in north central Minnesota is one of the finest examples of the Minnesota's natural splendors. For travelers seeking access to larger metropolitan cities, the communities surrounding Lake Minnetonka feature access to a plethora of outdoor pastimes combined with easy access to Minneapolis/St. Paul. With the wide variety of activities set amidst the wonders of nature, Minnesota is a great spot to invest in land. 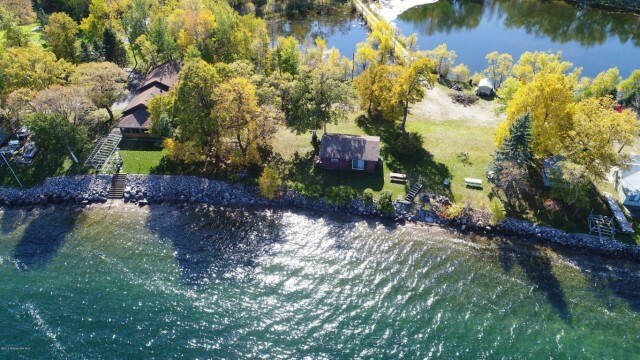 Recreational real estate here in Minnesota can be a great investment, allowing families to minimize their annual family vacation costs and providing rental income throughout the remainder of the year. Investors with larger budgets seeking to relocate to the area may even wish to consider purchasing a larger hobby farm or campground facility. All-in-all, Minnesota is an excellent choice when looking for an area in which to invest in land. If you have a green thumb and are looking for a dramatic career or life change, consider the possibility of investing in farm land in Minnesota. Large industrial crop and dairy farms are occasionally available for purchase. From beans to mushrooms to grapes, Minnesota's fertile soil is excellent for cultivating a wide variety of crops. Livestock farms raise animals such as horses, pigs, poultry, cows and sheep. Even flower farms are in demand in the Minnesota region. Large, industrial farms for sale can be an ideal investment for individuals seeking to embark upon a new career opportunity. For those looking for a weekend hobby or a retirement career, hobby farms can be another excellent alternative. While hobby farming can be lucrative, it will require a great deal of personal effort and some luck. But for those casual investors willing to take the risk and roll up their sleeves, hobby farms can be a great choice. Provided certain criteria are met, there may even be tax advantages and government incentives as a result of your investment in Minnesota farm land. For a dramatic life change, check out the countless agriculture and farming opportunities in the great state of Minnesota! Since the 1800's, the lumber industry has been an integral and important part of Minnesota's thriving economy. Today, timber remains a viable industry in the Minnesota Northwoods. The development of sustainable timber farming techniques have helped to ensure the success of this industry into the future. Even if you are not an outdoors person, Minnesota can still be the perfect place to relocate, invest in land for sale and establish your dream business. With the thriving tourist economy, restaurants, antique shops, professional offices and retail stores can all be valuable investment opportunities. If your interest is peaked by the countless opportunities Minnesota has to offer, keep looking! Perhaps you will find the perfect land investment opportunity here in beautiful Minnesota!